Have you noticed the increased popularity of chalkboards these days? People are turning everything into chalkboards by using chalkboard paint. The paint comes in lots of different colors and is fairly easy to use so it’s a good project for even the less “crafty” person. I’ve even seen entire walls painted with chalkboard paint, which gives a whole new meaning to kids marking on the walls. As the mother of six that may have been a good approach although I’m not so sure my brood would have been satisfied to stay in the lines so to speak. 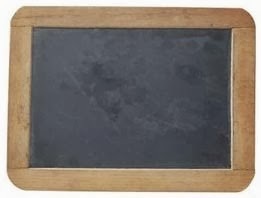 Back in the day a chalkboard was simply called a slate. It was basically just a piece of slate with a frame around it. Schoolchildren would write their lessons on it and when completed and graded they would wipe it clean. When it was time for a new lesson they would start over with a clean slate. One of my favorite scriptures is Lamentations 3:22-23 that says, It is of the Lord's mercies that we are not consumed, because his compassions fail not. They are new every morning: great is thy faithfulness. Wow, how awesome is that? God’s love and mercy isn’t just a one time thing or something He hands out occasionally when He feels particularly benevolent but it’s new each and every day. Every morning is met with a new beginning, a fresh start, a clean slate. It makes no difference how far we missed it the day before or how far we marked out of the lines. I John 1:9 tells us if we ask God is faithful and just to forgive us. The mistakes are gone, completely erased. He will clean our slate. I don’t know about you but that makes me breathe a big sigh of relief. We have all struggled with the failures of yesterday. You may have blown your diet, spoke out of turn, hurt a loved, given in to temptation and maybe even sinned. God doesn’t want us to live in yesterday’s defeat but in today’s possibility. He has given you the gift of a clean slate. I don’t know what your chalkboard looked like yesterday, but I know what it looks like today. Chalk in hand you can rewrite today. Come on, you can do it, just one good push. I wonder how many times we’ve heard that phrase? We’ve been encouraged to push the envelope, to push forward and to push through. It seems there are many times when what is needed to accomplish our goal is just one good push. Have you ever thought about the fact that almost everyone who has ever been born started life with one good push? Any woman who has experienced childbirth can tell you about pushing. Unless the push process was interrupted by a Cesarean delivery that baby entered this world by one good hard push from mom. Wow, mom was an example from the very first moment of our life. This is how you do it kid, just one good push. I started a “little” exercise program this week. No gym, no weights, no trainer, no boot camp mind you. I’m just trying to walk one mile a day. It’s actually a video-walking program that you can do at home, in your P.J.s no matter what the weather. I do wear my tennies but I have to put then on while I’m still half a sleep before my feet know what I’m doing. It works for me. Monday, day one, I did ok. I had worked myself up to it and convinced myself I could do it. Tuesday, my calves were pretty sore but I got through it. Wednesday I was beginning to think this isn’t such a good idea when my knee started revolting and by Thursday I was talking back to the lady on the video. Let’s just say I wasn’t blessing her. By Thursday night I was fighting going to bed because I knew when I woke up it would be time to walk another mile. I finally comforted myself with the thought that I probably should take Friday off anyway to let my muscles recover and fell asleep. And then morning came along with this thought; just give me one good push. 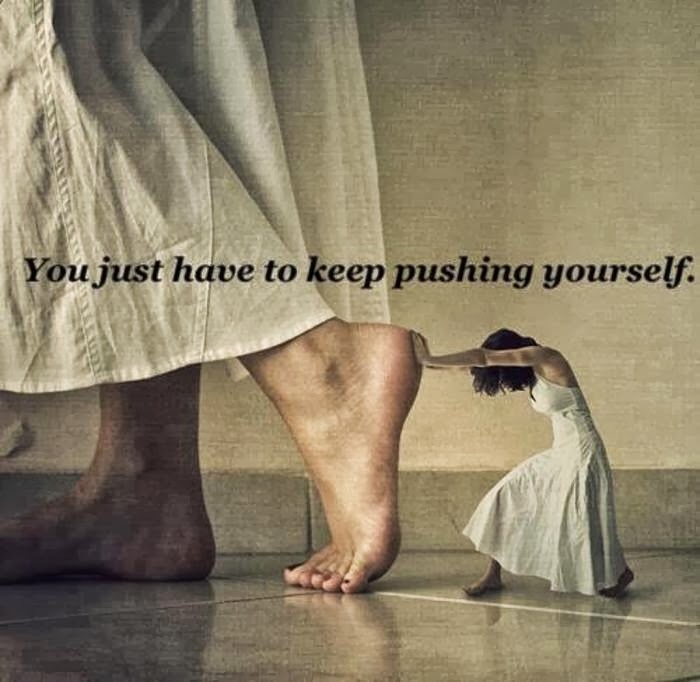 Push forward, push through, you can do it. So with much reluctance I got out of bed, put on my tennies, and gave it one good push. And guess what? I made it one more mile. I can’t help but think that’s really how life is. We start with one good push and it takes a lifetime of those to reach our destinations. Sometimes it seems that’s all we have left and then find out that was all that we needed. 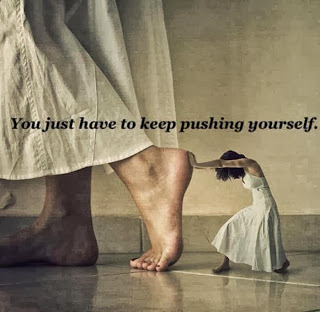 Other times we don’t have the strength to push on our own. I remember back in the day when often that’s what it took to get a broken down vehicle going again. Some good neighbor would always show up and say, hey I’ll give you a push. And sure enough you would be off and running again. All you needed was a push. Do you think that’s what God meant when He said in 2 Corinthians 12:9, “My strength is made perfect in your weakness?” Just when we think all power is gone, we can’t take one more step, we are done, there it is, one good push. Could it be that God shows up and says, hey, I’ll give you a push? I believe that’s what God is saying to us today. Keep pushing friends. Don’t give up! Pushing toward the goal. Pushing back the power of the enemy through prayer. P.U.S.H. Pray until something happens. You can do it. Maybe not in your own strength but in Him all things are possible. You know that’s my story. Not that I’ve accomplished all that much but I know how far He has brought me. So there is hope! Anything’s possible. It may be just one good push away! Phil 3:14 With my eyes fixed on the goal I push on to secure the prize of God's heavenward call in Christ Jesus. Have you ever had a light bulb moment? You know the kind. It’s like a light is turned on in your mind and you just get it. A second ago you just couldn’t quite wrap your brain around it and now it makes perfect sense. Weird isn’t it, how that happens? Last week I wrote about sharing at a recent women’s event, Café Chocolat. It was a blast and my favorite thing to do. No, my favorite thing is not eating chocolate, although that’s pretty awesome, its sharing God’s Word and what He has done in my life. And it’s just this kind of story that makes it all worthwhile. I was having some test on Thursday and still needed a few things so Wednesday I used my lunch hour to run some last minute errands. 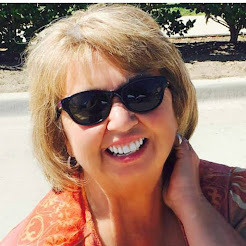 I stopped by Wal-Mart and as I was leaving I ran into a very sweet lady I met at Café Chocolat. We stopped to chat for a moment and she said there is something I want to tell you. She went on to share how much she enjoyed Café Chocolat and then she said something that I’ve been thinking a lot about. You know, I’ve been a Christian a long time but at 63 years I Got It! She went on to say that for the first time she understood about sin and what God had done for her. She knew it before but she really understood it…she got it. Then she proceeded to share how since attending HighRidge Church and listening to Pastor Jeff’s messages she understood God’s Word and the things of God in a completely different way. The light has gone on and she just gets it. So, I’ve been thinking, what a great way to pray, to ask God to help us get it. You know the first thing God said in the Bible was, let there be light. (Gen 3:1) I know we’ve been told not to question God. I’m not talking about questioning His existence or wisdom, or any of that. I’ve always just been honest with God. Sometimes it’s okay to say, Lord I just don’t get it. I need you to shed some light on this situation. I think that’s just the sort of prayer that makes God smile. If He could light up the entire world with one sentence He can certainly shed a little light on your problem. Some of you have heard my story of how I just didn’t get the whole thing about God’s love. I was pretty honest with Him when I admitted I really liked Him a lot but was not all that sure I loved Him. You see, I knew I loved my husband, Lawrence. I knew I loved my children. But, I really wasn’t in any hurry to be with Jesus and I just wasn’t sure I loved Him like I should. I John 4:19 says, We love him because he first loved us. God knew I just didn’t get it. So guess what? He must have said, Let’s shed a little light on the subject because the Holy Spirit revealed God’s love for me in such a powerful way that I fell hopelessly and desperately in love with Jesus. I got it! I feel I need to add one more thing. Light bulbs burn out and sometimes they need to be changed. For whatever reason there are times in our lives when we used to get it, really get it but the light has just gone out or gotten pretty dim. That’s when our prayer should be, God I need to get it back. God wants you to walk in the light every day. He says so. (I John 1:7) So whatever place you find yourself in today God wants to shed a little light on it. Maybe you just don’t get it. Maybe you need to get it back. Go ahead and ask for God for a light bulb moment. Let there be light! Last weekend I had the privilege of sharing during one of the sessions at Flourish Café Chocolat, a one-day women’s retreat at HighRidge Church. It was a great time and yes we had lots of chocolate. We also had fun making new “barefoot friends” and above all experiencing the sweet presence of the Lord. My session was the last session of the day and the focus was on God’s unconditional love and forgiveness. Because of His love he died for us even though some of didn’t seem weren’t worth dying for. It’s one thing to die for a good person and not many would even be willing to do that but to die for someone who is for all practical purposes pretty bad is unheard of. Yet that’s just what Jesus did. God doesn’t really ask much of us but one thing he does require is that we extend that same love and grace to others. He doesn’t ask us to die for them, thank goodness, just forgive them. It sounds easy doesn’t it? But not so fast, forgiving someone doesn’t always come easily and especially if you are a brand new Christian who thought it was perfectly justified to dislike or hate someone who had wronged you. That’s exactly where I found myself. There was a man that I hated. I’ll call him Brutus, not his real name. Brutus had publicly humiliated me in front of a room full of people and it hurt and embarrassed me very deeply. I was very happy hating Brutus but then I got saved. I’ll never forget when God started dealing with my about forgiving him. I said to the Lord, no way and if this is a requirement we need to rewrite the rules because I cannot forgive him for what he did to me. Then the Lord gave me an assignment. He told me to start praying for Brutus everyday. Are you kidding me Lord was my reaction. But God made it clear this was my assignment. So I told the Lord, OK I will pray for him but I won’t mean it. I figured if I had to do something as distasteful as pray for the old Brut I might as well do it while I did something else I didn’t like. So everyday while I did the dishes I would pray for Brutus. I prayed for God to bless him and his family, his business and all that pertained to him but then I always ended with the disclaimer that I didn’t really mean it. Well this went on for awhile and I would rub those plates as hard as I could imagining they were Brutus’ face. But then…one day I was praying for him and I didn’t feel angry. I remember trying to be mad at him but I didn’t feel any hate or anger in my heart. So my prayer changed. I said you know Lord, go ahead and bless Btutus. Bless his family, his business….all that pertains to him. Bless him Lord. And I meant it. Every word of it. The hate, the pain, the unforgiveness was gone. My heart felt clean inside and I was filled with peace. I had more than dishpan hands, I had a dishpan heart. Is there a Brutus in your life? Is there someone you need to forgive? Begin to bless them. Begin to pray for them. 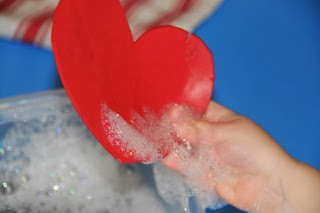 You too can have a dishpan heart.